Mountain Manor Superior Serviced Apartments - Gardens Cape Town Accommodation. 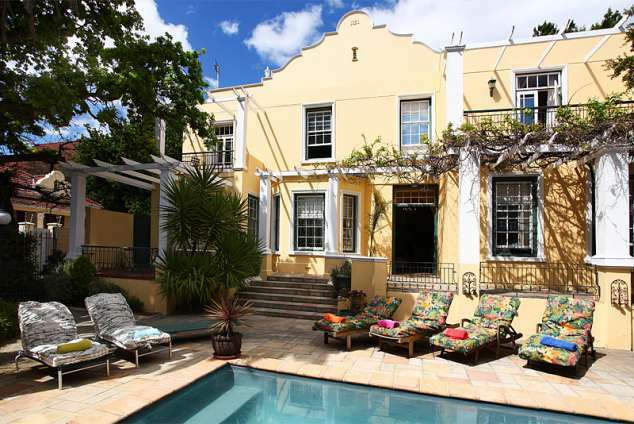 Harrow House is a beautifully restored 4 star graded, Cape Dutch Style House dating back to 1851 and comprising five luxury serviced apartments. Each apartment has its own unique 'Cape Provencale' style and character - a look that is unfussy, uncluttered, definitely relaxed and inspired by the Cape's unique light and temperate climate. It is adjoined to Mountain Manor Guest House which offers meals, honesty bar, tour assistance and catering. Conveniently located in the heart of town, very close to the Mount Nelson, and one minute's walk from Gardens Shopping Centre, the property nevertheless retains the ambience and feel of an exclusive boutique hotel, sitting within substantial walled grounds protected by electrified fencing, ensuring safety, privacy & secure parking within the property. Harrow House also has a large swimming pool and plenty of space to stretch out and relax. All the apartments are proper, self-contained units, with their own bathrooms, fully equipped kitchens, satellite TV, phones, Wi-Fi access. Whether a holidaymaker on vacation with a young family, or a working professional in town on business, Harrow House can cater for all requirements. Harrow House rates include secure off-street parking and maid service, with the apartments being cleaned daily. The smaller apartment sleeps 2, the Middle two sleep four, the larger, 2 bedroomed apartments, up to 6. 35965 page views since 22 Dec, 2004.